I've wanted to read this book for a while. So when my daughter put in a request with our local library and they got it, I couldn't wait to get stuck into it. And wow... I loved it! So much. The writing style is beautiful and wraps around you like a warm blanket. But this blanket isn't comforting. It contains many dark and hidden things, plus lies and stories that make it hard to tell what's true and what's not. There are so many stories within the story that I couldn't help but get swept up in the magic of it all. Don't get me wrong, though. There might be magical elements to this story, but ultimately it's a contemporary YA story about what happens during one fateful summer. 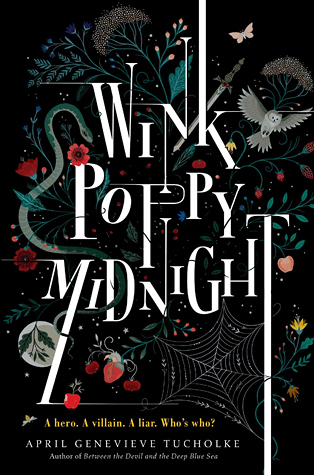 Told in the alternating POV of two girls--Poppy and Wink--and one boy--Midnight--we get intimate details about each character. Midnight has been in love with Poppy for years, but she constantly uses him. No matter how physical they get there's still a distance between them. Poppy has secretly been love with one of the Bell kids but Leaf never had time for her, and now he's gone. Wink is peculiar and cute, a girl who loves her family but is always lost in a world of fairy tale stories she tries to apply to real life. When Midnight moves away with his dad to an old house across from the Bell farm, he thinks he's getting away from Poppy. But no one gets away from her until she's ready. This book is enchanting. I loved the weird and fantastical way this story was told. I enjoyed the three POVs a lot! And the small twists are really exciting too. Yeah. This book is amazing and I will definitely be buying a copy!